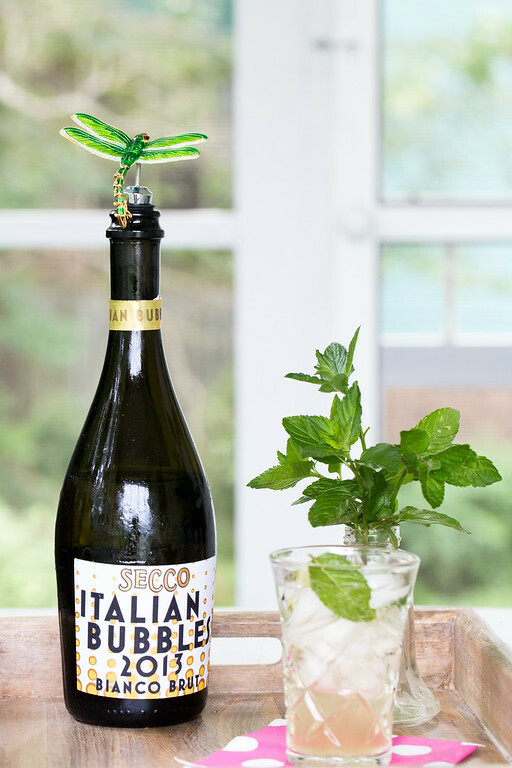 A summery cocktail that pairs fresh ginger and mint with your favorite Prosecco for a refreshing treat! Is it just me or does it seem like the seasons kind of crawl along and then all of sudden it’s like a switch is flipped, and boom, you are in that season? We’ve been having spring in little bits and bursts and then it seems like I woke up and it was summer! Blue Skies. Hot sun. Mosquitoes. Weeds. Wow, that list went from good to bad in a hurry, didn’t it? I don’t want to come off as a negative Nelly, but summer is not really my favorite season. I like the concept of summer: lazy days, children laughing and playing, the drone of the lawn mowers in the early evening, fireflies. I hate heat, though. I hate the ripples of heat rising off of pavements, that rush of it when you open your car door, the humidity so high it’s hard to breathe. But I’ve discovered a remedy. Something to make the summer bearable. Summer cocktails. Is there any better time for a tall ice filled glass of something sparkling? Something sparkling with hints of mint and ginger. Bubbles that tickle your nose and suddenly it feels ten degrees cooler. I’m talking about a mint ginger spritzer – this is summer relief in a glass. I found Thai Basil-Ginger Spritzer in the latest issue of Cooking Light. I don’t even have my basil planted yet (see first paragraph explaining the whole season switch phenomenon), but then I saw that you could use mint or cilantro instead. I ran around to the side of the house to check my mint bed and saw that it was well aware that summer had begun. Sweet. First you make a simple syrup infused with ginger, mint and kaffir lime leaves (I buy them from a market when I’m in Atlanta and keep bagfuls of them in the freezer). Then you make a quick run to the liquor store and pick up a bottle of prosecco, I found Secco Italian Bubbles from Charles Smith Wines (I’ll be reviewing it later.) In a short time, and hardly any work later, you have one fantastic cocktail. Hello summer. I think I love you. Combine the water and the sugar in a small saucepan. Heat to a boil and cook for 1 minute. Remove from the heat and stir in the mint sprigs, lime leaves, and ginger. Cover and let it steep for 10 minutes. Then strain out the solids and store in a jar or bottle. Place 1/2 cup crushed ice in each of 6 glasses. Add a few mint leaves to each glass and stir to bruise them a bit. Add 2 tablespoons of the simple syrup mixture, 2 tablespoons of the simple syrup mixture, and one lime wedge. Stir gently. Serve immediately. Save the rest of the simple syrup for another cocktail! Thanks to everyone who linked up last week to Tipsy Tuesday. Remember I share all of your posts on twitter, and most also on Facebook! I would love it if you would link back to my website, you can grab my button if you’d like. Oh yeah. I’m all over this! Sounds refreshing! Perfect for hot weather. Wow…doesn’t that look refreshing. 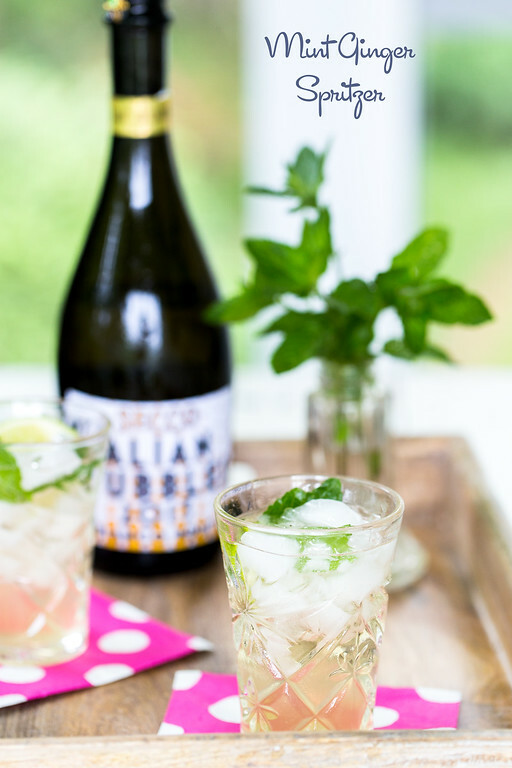 I love a bubbly Prosecco and this sounds perfect for a afternoon cocktail. One of the best things about summer is the cocktails, am I right? This sounds SO good, and I would totally use the mint over the basil. I actually do have my basil plant in the ground…well, a container on the back deck, and am rooting even more, but have yet to get any mint. I’m right there with ya… winter was just yesterday, right?! Now it’s a million degrees and the mosquitoes are atrocious. This drink looks like the perfect way to cool off and relax! Cheers! Trust me, I totally get the wonky growing season. We had to bring in all of our plants last night because it was going to go below freezing. Sigh. Hello, Pam! Found you through Thursty Thursday … thank you so much for hosting Tipsy Tuesday! I’ve seen so many mint spritzers lately. I’m not big into mint flavored foods and drinks, but I think i could handle this one. 🙂 Thanks for the linkup and as always, thanks for linking up!! The mint is really subtle in this. I think you would like it! This sounds light and refreshing. I love cocktails with mint! This sounds fantastic! Love the ginger/lime combo and I’m sure adding the mint is even better! I have all these ingredients in my fridge! Score, Friday night cocktails have just gotten a little more interesting! This looks refreshing, perfect summer drink! This looks delicious. Unfortunately I’m pregnant so drinking isn’t an option RIGHT NOW… but I think if i subbed in club soda this would still be nice, and then when the time comes, add a little prosecco! 🙂 Prefect for saturday cocktail hour and not to sweet what so ever! Love it! Just yes! This looks fantastic for SO many things! This spritzer looks amazing! It’s so perfect for summer and who doesn’t love ginger and mint….yum! I love keffir lime leaves. I saw this recipe and while I haven’t made it yet, I know it will become a favorite. And I think it will be almost as good as a mocktail.